Australia vs South Africa First Test Series Squad 2016 Announced : The Australian selector named the 12 member squad for the first two test matches against the South Africa that is scheduled to kick off on November 3, 2016.The squad will be lead by the regular skipper Steven Smith and his deputy David Warner will fire at the top of the order. Meanwhile, David Warner’s partner Joe Burns has been dropped after his poor runs in the last test series in Sri Lanka. Shaun Marsh will replace the Joe Burns at the top of the order. The middle order of the Australian team will be held by the likes of Steven Smith, Adam Voges, and Usman Khawaja. Peter Nevill will wear the gloves behind the stumps. The all rounder role will be fulfilled by the Mitchell Marsh as the 25-year-old lad will support his team both with bat and ball. The biggest positive for the Australia is the return of the Duo of Mitchell Starc and Josh Hazelwood for the test series. Starc will be in a hurry to come out of his freaky injury. Apart from these two, Peter Siddle is back in the side and will be likely to share the ball with Hazelwood in th first test. Joe Mennie who has impressed everyone with his swing on the recently concluded ODI series against South Africa has been called up for his maiden Test series. Nathan Lyon is the lone spinner in the squad and will come handy with spinning the red cherry on Perth for the first test match. 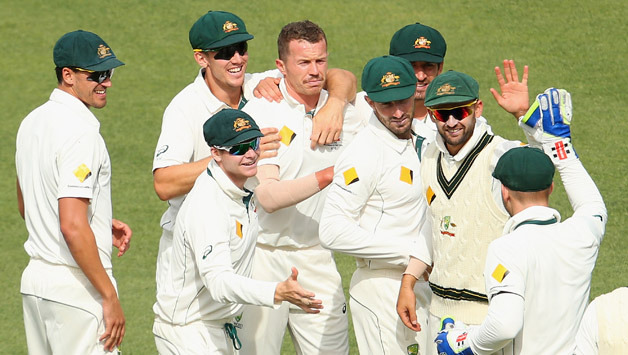 The first test match will kick off from November 3, 2016 at Perth.